Burgeoning Wolverine Star: Ezeh vs. Kovacs: Who's responsible? How are the initial returns on the GERG Linebacker Magic theory? 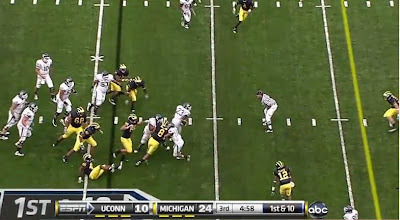 In this play, UConn is running power, off tackle (running between your right tackle and right guard, with your left guard pulling across the line and acting as a lead blocker). But despite Ezeh not actually making the tackle, I don't see any way that the responsibility on this play doesn't fall squarely on the shoulders of Jordan Kovacs. Michigan is lined up with a three-man front and will be bringing a blitz from the weak side of the play. Ezeh is playing middle linebacker and Jonas Mouton is the playside linebacker. On the near hash at the 21-yard line is Jordan Kovacs. Cam Gordon is lined up on the far hash and is playing as deep as Kovacs. At the snap, Kovacs immediately starts to drop back into pass coverage and won't stop for a while, as we'll see. 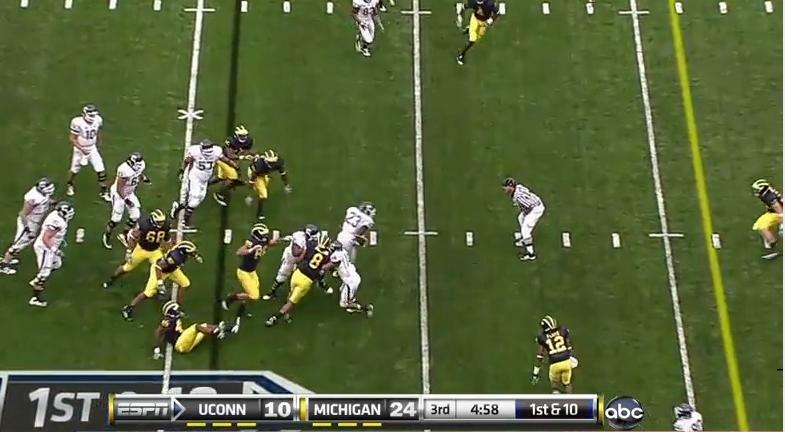 Martin is being double teamed by UConn's center and right guard. 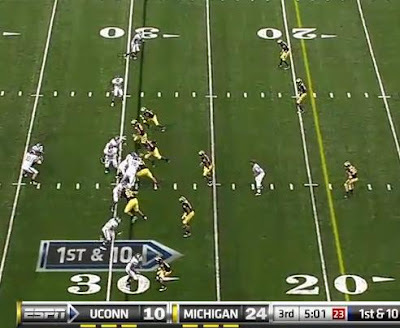 The UConn left guard has started to pull across the formation to act as the lead blocker in charge of hitting Ezeh. The play side slot receiver is going to block Mouton. 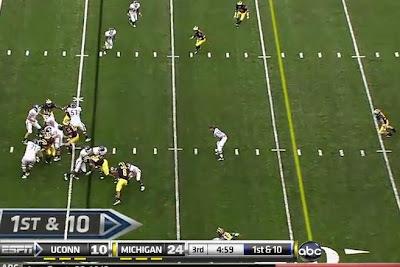 Greg Banks (the playside defensive end) is being sealed to the outside by UConn's right tackle. Here, you can see that Kovacs is still backpedaling, now 4 yards deeper than he was pre-snap. Mouton is being hit by the playside slot receiver. 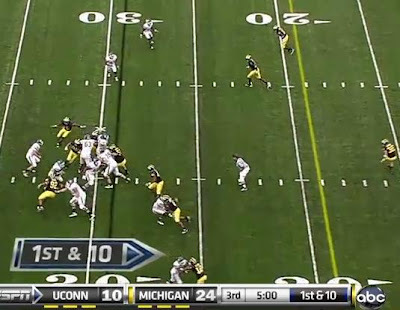 UConn's left guard has now pulled across the formation and is in perfect position to block Ezeh. Ezeh's job here is to plug the hole that Todman is supposed to run through. He does this by hitting that pulling guard. It's then Kovacs' job to come into the play and make the tackle. Unfortunately, Kovacs isn't done backpedaling yet. Kovacs, after taking a 5-yard drop, now realizes that this is a running play and has started to get into the game. 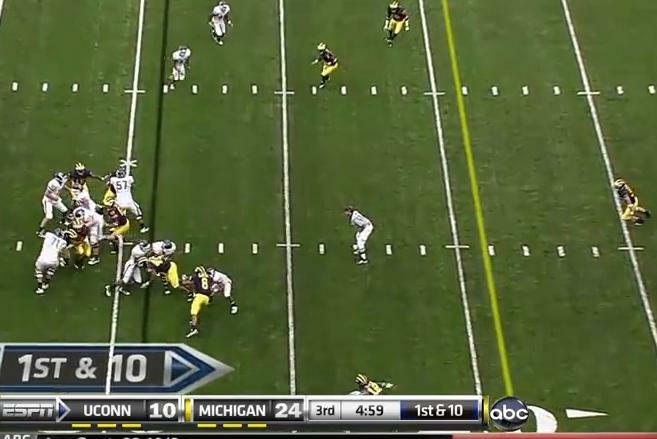 But he's so far off the line of scrimmage that there's almost no way this play doesn't go for decent yardage. Ezeh is attacking the play. He's making contact with both the pulling left guard and Todman, but ends up getting blocked to the ground by the guard. Todman is about to slip past him into the middle of the field that has been completely vacated by Kovacs who took far too long to diagnose the play as a run. The UConn offensive line has now done their job. The linebackers have been taken out and Todman is releasing to the next level. Kovacs is still 8 yards away from Todman without any momentum. He's a sitting duck. (Have you ever tried to stop someone running full speed at you when you are flat footed?) In fact, if it weren't for the referee standing right in the middle of the play (forcing Todman to cut to his left), I'd venture that this play has about a 50/50 chance of going for a touchdown. But Todman has to cut around the referee who's trying desperately not to be in everyone's way, and Cam Gordon has come from across the field to make a nice wrap up tackle. I'm usually with Brian that Ezeh makes the wrong read and generally finds himself on the wrong side of should be no-yardage plays, but this one falls squarely on this blog's goat. If Kovacs diagnoses this play quicker or doesn't drop 5 yards into coverage to compensate for his lack of elite-level speed, this is probably a two-yard gain. Instead, Todman is given an 8-yard cushion to play around with and rumbles his way for as many yards. Brian's argument against Ezeh here is that he needs to funnel Todman to the outside, which I think is patently wrong. If Ezeh pushes Todman outside by taking a different angle on the block, UConn has two blockers against two Michigan defenders. The numbers are squarely in favor of UConn here, and the play eventually becomes a foot race between Kovacs (coming from the middle of the field) and Todman. All of Ezeh's help in this play (his weak-side blitzers, linebackers, and other safeties) are to the middle of the field. Simply because Mouton was able to get off of his block quickly in this instance does not mean that's where Ezeh was supposed to force the play. I dunno dude. Just because UConn is sending a guard to the second level doesn't mean that our middle linebacker should just get blocked by him. If Kovacs had a lane assignment on that play he probably wouldn't have dropped so far off the line. That was Ezeh's lane and he definitely did not fill it, blocker or no. He fell to the ground. The only way Kovacs should've dropped that far into coverage was if that was a play action pass. He should've taken a step back (that's deep safety's first move on such plays), but once the ball is handed off, he needs to recognize the play as a run. He doesn't do so until Todman is at the line and was backpedaling the whole time, despite the receivers not heading downfield. At that point there's no way that play doesn't go for the yardage it does. UConn designed that play specifically to have the pulling guard block the middle linebacker. That's what is supposed to happen. It happened, and that's fine. Brian's contention is that Ezeh needed to force the play outside, which I think is seriously wrong. And if forcing the play back inside is Ezeh's move, which I'm relatively certain it is here, that play needs to be made by Kovacs. I would be shocked if this is Kovac's fault. He can't have both deep pass and cutback run responsibility. That defense would fail every play. More importantly, look at how Mouton plays this. He fights his blocker for outside position. He clearly has outside contain. If Ezeh takes a proper angle, the back bounces outside into Mouton's arms. One yard gain max. Instead, Ezeh over pursues and the back has an easy cutback. Also, Ezeh would have much better leverage (and would smack the guard in the mouth) if he took a proper angle. Instead, his over pursuit gives him a poor angle to attack the blocker and he is pancaked. Heres what I see as a coach so let me clear this up for you. 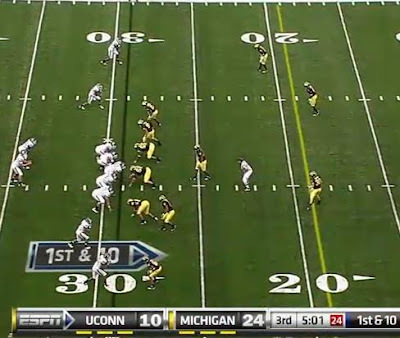 On this play Michigan is showing a coverage at the snap (my guess is a Cov 6 , 2 to the boundary, 4 to the field) with Kovacs playing the deep half to the boundary side. On the snap they are rotating the coverage to the field into a Cov 3 so they could blitz off the edge, bringing one safty up, and Kovacs has to drop to his deep middle 3rd. In this case, Ezeh is not a leverage player Mouton is, he was supposed to spill the ball carrier (make him bounce out)right to Mouton. I agree completely with "a different anonymous." My use of the term "leverage" is probably imprecise. All I meant to say is that Ezeh took a poor angle (he should protect against the cut back and force the back to bounce out to Mouton, as "a different anonymous" said) to the line of scrimmage and, as a result, was in poor position to attack the pulling guard (this is why he got pancaked). If Ezeh attacks the guard's inside eye, rather than the guard's outside eye, Ezeh would be able to stand up the pulling guard and Mouton likely makes this tackle.